of Yinchuan, Capital of Ningxia Hui Autonomous Region, China. Hotels in Yinchuan should be divided between those within the Old City (Lao Cheng) and those in the New City (Xin Cheng). Make your choice depending on your travel itinerary and mode of transportation. Widely recognized and recommended as among the Best Hotels in the Old City is the 5 Star 'International Hotel' which has a quiet environment, excellent staff and is conveniently located left and adjacent of the Yinchuan Entertainment Palace where many shows can be witnessed. It is not to far walking to reach the interesting Yuhuangge and one of the main shopping and recreational zones. The International Hotel however is a bit on the pricy side. Even better and chosen as the DrBen.Net favorite Hotel in Yinchuan is the Shengshi Garden Hotel, which with its excellent 3 star service clearly aspires to more. The Hotel offers great service with some English speaking staff, free breakfast, free internet, clean luxurious rooms with good air conditioning and bath, and even a sauna and refreshment center. The Great Wall Hotel is a modern facility located farthest away from the Old Town but nearest to the Western Xia King Tombs (XiXia Wanling). The Hotel is set along the ring road that encircles the Three central Urban Districts due South-West of the City Center. It is a luxury hotel with good access to the various XiXia Tombs outside of Town but with poor access to any of the City Landmarks. Not at a very attractive location but reasonable for access to the Main Train Station of Yinchuan. The Hotel stands about one kilometer away from the Old City Center and 1.5 kilometers from the Train Station. Plusses - Great in-room Internet Access: Deluxe Digital E room broadband Internet access free of charge. Accepts a range of Foreign Creditcards. The Yuhuangge Hotel, which is also located along Yuhuangge Bei Jie, but stands near adjacent the Yuhuang Pavilion. The Xixia Hotel is a great Facility for those who want to stay near the Yinchuan Long Distance Bus station, which is located in the South-Eastern Corner of the City with access to the Highway. Address: East Changcheng Road, South of- and across from the Long Distance Bus Station. between Yuhuangge Pavilion , Drumtower and Nanguan Qinzhen Si or the South Gate Mosque. Holiday In Hotel. Constructed in 2006 with 230 rooms, it supposedly offers the first fully western Hotel experience in Yinchuan, courtesy of the Holiday Inn chain. Part of the Interiors of a standard room at the Shengshi Garden Hotel (2010). Fully modern rooms include excellent air-conditioning allowing for some downtime from the excessive heat which comes reigns throughout summer months. This Hotel is very popular among foreign tourists and tour-groups staying over in Yinchuan. Conveniently located just 3 (small) city blocks North of the Yuhuang Pavilion and the Drum Tower of the Old City. 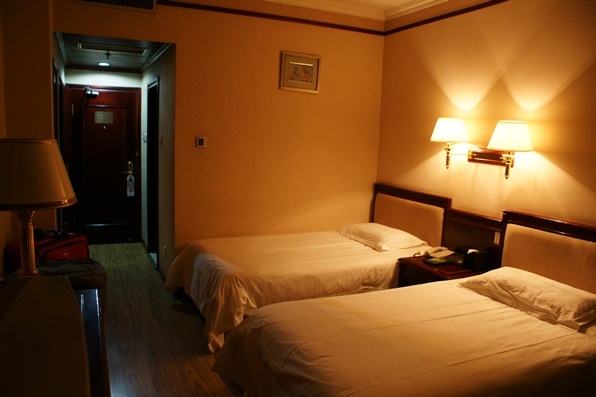 Another good Hotel to stay may be the Gulou Hotel situated in the Old City section of Yinchuan near the Drum Tower. It is a nice 3 story building with low priced rooms, a nearly perfect location and working air conditioning in every room. Although the Gulou Hotel does not have an english speaking staff, it is very well located sitting right across from the Drum Tower and at the beginning of Yinchuan's main shopping street. Check in at the Gulou Hotel if you would like to be in the most scenic spot with the best athmosphere while keeping an eye on your budget. Rooms are clean and neat, a bug and mosquito free. For more expensive rooms and more luxury treatment a steady bet is the nearby 3 Star 'Era Mansion Hotel' which is situated not at the Drum Tower but just beyond, very near Yinchuan's landmark Yuhuang Pavillion and adjacent from the above described Shengshi Garden Hotel. Although the Era Mansion Hotel is being refitted (August-September 2010) it will soon re-open its doors with excellent 4 star service, internationally oriented staff and comfortable rooms. As with its neighbor the Shengshi Garden Hotel the Era Mansion is exellently situated just across from the Fruit & Vegetable Market and only a 100 meters or so upstreet and North of the Yuhuang Pavilion. Sleeping just out of reach from any hustle and bustle you will be fully serviced plus in a short walk will find yourselves in Yinchuan's main shopping area, cultural zone and near its Hui islamic Quarter. Address: No.123 Beijing Road East also goes recommended. 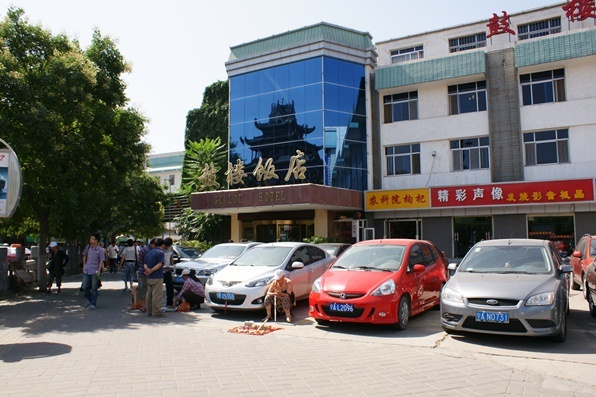 Cars parked in front of the Gulou Hotel in Yinchuan on a sunny day in July 2010. Local women are selling small household items. The exterior of the Yuhuangge Hotel adjacent the Yuhuangge Pavilion in Yinchuan, Ningxia Hui AR. Although not entirely fresh and modern rooms come at a good rate and with excellent location. North-South surge specialty; features ballroom-style for 300 people dining at the same time. 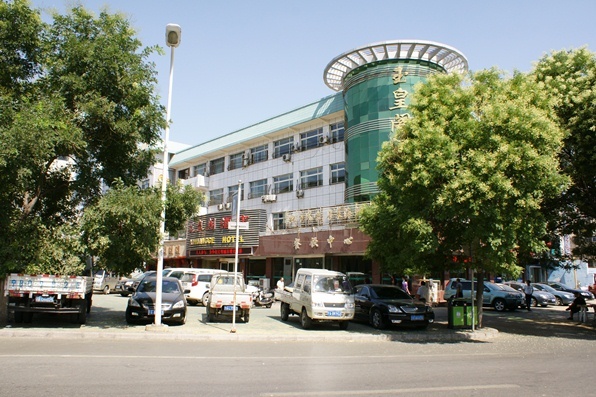 Transport: Away from the old city center of Yinchuan: 20-minute drive from the railway.